University of Richmond junior Najwa Labban, of Richmond, Virginia, has been awarded a Beckman Foundation Scholarship. Labban is double-majoring in biochemistry and Arabic with a minor in mathematics. The University of Richmond has received four consecutive awards from the Arnold and Mabel Beckman Foundation to support student research in the sciences. Labban is working on research related to the development of biosensors that monitor levels of different chemicals for diagnostic purposes related to potentially life-threatening health concerns like prostate cancer and sepsis. Labban is completing her research with UR chemistry professors Julie Pollock and Mike Leopold. The Beckman Scholarship will provide research support for two summers and the 2018-19 academic year. Labban will also have the opportunity to attend and present at the Beckman Scholars Symposium in Irvine, California. Labban has presented at the Southeastern regional and national meetings of the American Chemical Society, and her research has been published in the Journal of Electroanalytical Chemistry. After graduation, she plans to pursue an M.D./Ph.D. in biochemistry. 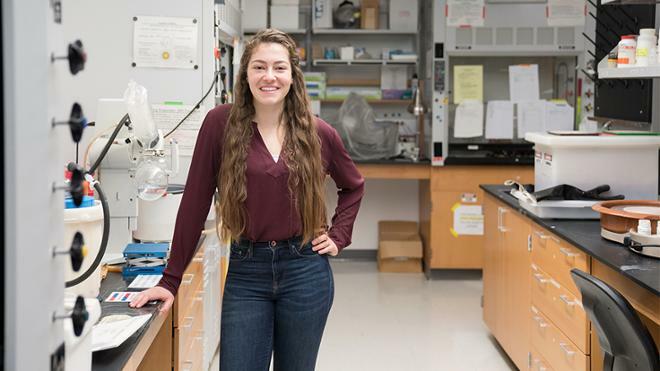 The University selects Beckman Scholars based on their demonstrated commitment to research, strong academic records and potential to become scientific leaders. This research team is also working with Will Case, assistant professor of chemistry at Converse College.